He doesn’t need any translation. Yuriy Zozulia speaks Polish fluently. A 26 year old was recently appointed as the Head of Kiev Patrol Police. Before taking the position in the capital he was in charge of the Lviv Patrol Police since August. Yuriy Zozulia doesn’t hide, he wants to learn more about the experience of his European colleagues to contribute the work of Police operating in the biggest city of the country. 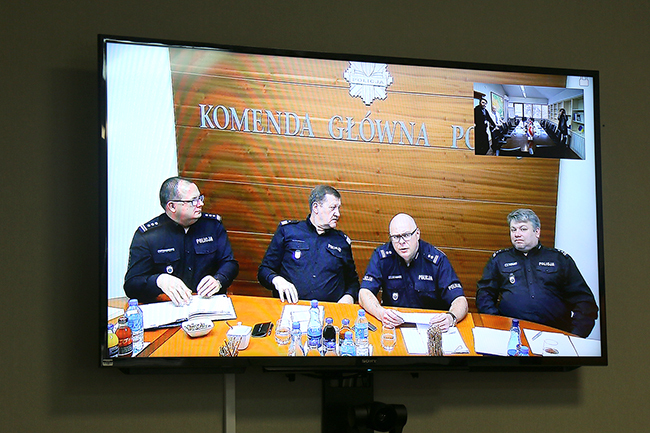 European Union Advisory Mission (EUAM) facilitated the meeting where the representatives of the newly created National Police of Ukraine and the International Criminal Investigative Training Assistance Program, which also supports the reform, could learn more about the processes, which took place in the Police of neighboring Poland when the Law Enforcement Agency was moving from the Militia model. The representative of the Chief of Police for the cooperation with local governments and NGOs, Wladyslaw Padlo, the representative of the Chief of Police for the protection of human rights, Krzysztof Laszkiwicz, the Head of Department of History and Social Education of National Police, Daniel Glowacz, the Deputy Director of the Cabinet of Head of Police in HR matters, Tomasz Szankin shared their experience with EUAM’s guests via videoconference. “The experience of our colleagues from Poland, who also had to reform the old Soviet system is very useful for us. We are going through the same changes they faced in 90s. Human Resources is one among the main challenges that the New National Police is facing right now”, highlighted Yuriy Zozulia.